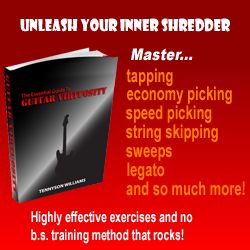 If you haven’t noticed already, one of the contributors to Shredaholic, Tennyson Williams, has cut the price of his downloadable book “The Essential Guide To Guitar Virtuosity” for a limited time to $29.99! If you’re interested in getting a dedicated manual to improving your speed on guitar, we’d highly recommend it. Also worth mentioning is the release of a brand new Marshall Amp Mods website called “Plexi Mods” – if vintage Marshall guitar amps are your thing, take a look!